A shocked dad has told how a family stroll turned to horror when he stumbled upon a badly injured teenagers after a clifftop fall in South Tyneside. Sebastian Nagy, 41, said he comforted the youngster after the 15ft plunge at Manhaven Bay on the Leas at South Shields at on Thursday. Minutes earlier, he had gone down to a small beach area with his daughter Dorina and son David, twins aged 15 who are holidaying from Austria, when he heard screaming. Mr Nagy, who is from Hungary but lives in Jarrow, said he was shocked by the youngster’s injuries, which he says included a severely damaged left knee cap. He asked a couple walking their dog to call the emergency services and comforted the boy until help arrived, including giving him water. The incident has sparked a fresh warnings from emergency services for people using the borough’s cliffs and beaches to be aware of potential dangers. Less than 12 hours after the boy’s fall, rescuers were called out in search of a dog feared to have gone over cliffs at Marsden. 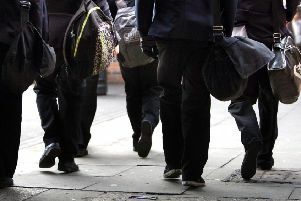 Mr Nagy, a fitter, said: “We heard screaming and I saw a boy with blood down one leg and he also had bruising under his chin and on his right leg. “But it was his left kneecap that gave me most concern, I’m not a doctor but it looked like a very bad injury. Tom Fennelly, honourary secretary of the South Shields Volunteer Life Brigade, urged the public to take extra care on cliffs and beaches. He said: “The cliffs and coastline are very beautiful places but they can be dangerous – cliffs do crumble, the tide comes in and the weather can change. “People should respect the safety warnings and not go anywhere that is not safe, and this also applies to dog walkers. The Great North Air Ambulance, North East Ambulance Service and Sunderland Coastguard Rescue Team also attended the incident.